With the push for people to get out and plant some food for themselves over the past few years, little has been said about the various creatures that descend and attack soon after those plantings. Could be that most gardeners with years of experience and well versed in the pain and heartache of pestilence, disease and just plain failure-to-grow-for-no-apparent-reason don’t want to discourage newcomers from getting into gardening. I completely understand that. Hell, we need as many people as humanly possible out there growing food right now. But it needs to be said folks: there are bad bugs out there and they’re coming for your crops. The following is not a laundry list, just the most common I’ve seen over the years. No question, it was the work of SVB larvae. 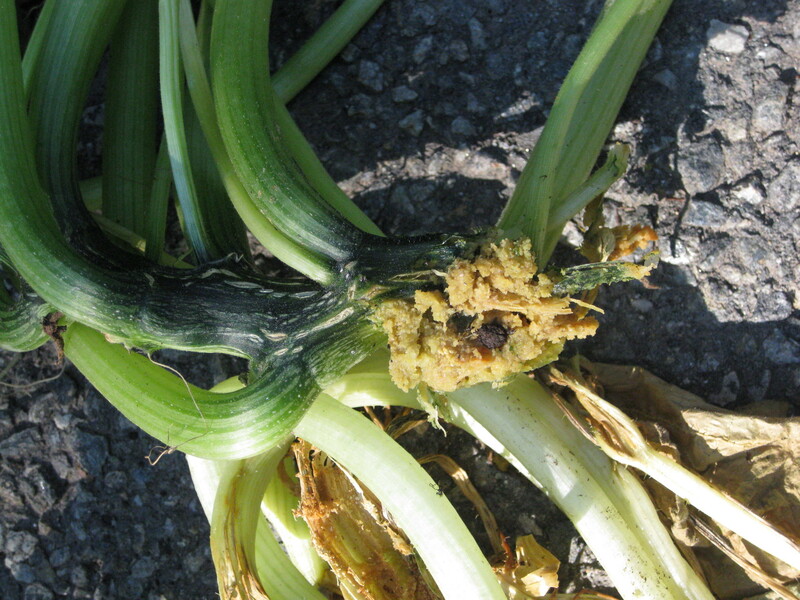 As they eat their way through a stem, they leave a pile of yellow-orange droppings resembling wet sawdust, called frass. Over the next few days, 5 of my plants fell victim to SVB. All were Zephyrs, a summer squash/zucchini hybrid that is mostly yellow in color, which is what attracts the adult SVB. All were pulled and put in the trash. There are a few ways one can try to save the plants with open-vine surgery, applications of Bt, etc., but I just didn’t have the heart. I still have 2 healthy plants. Next year, more vigilance! 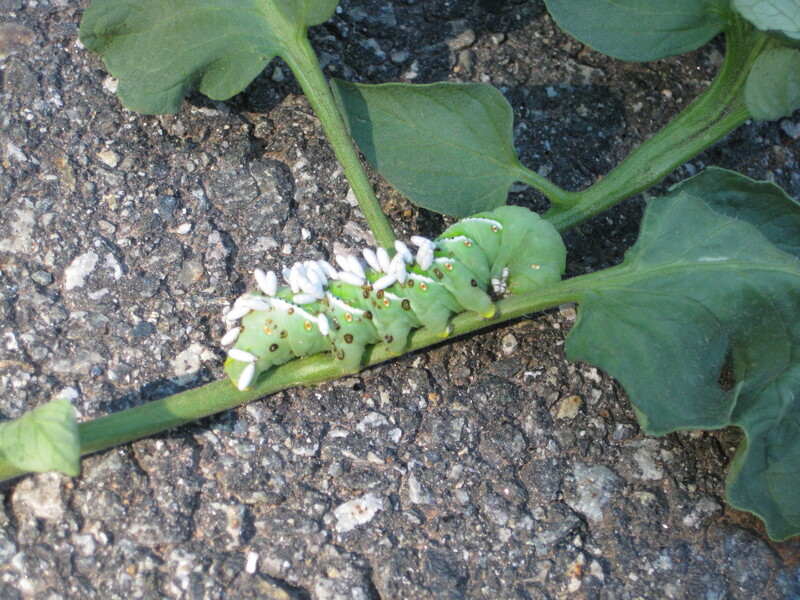 The Tomato Hornworm (Manduca quinquemaculata) eventually turning into a Five Spotted Hawkmoth. Also new to me this year. While one can easily miss the TH on one’s plant’s due to their green color, these guys easily caught my eye as they’d been parasitized, covered in wasp larvae. But those suckers did some damage. A couple of developing tomatoes had been munched on and 4 or 5 stalks had been chewed off (each of which had 3-5 small toms), which I thought was the work of a groundhog or squirrel. Solution: lopped off the branch they were attached to and put in the trash. No serious harm done here as long as I don’t see any more. The Japanese Beetle (Popillia japonica Newman). Southern NJ has the distinction of being the first place these lil’ bastards were found in the U.S. according to this fine USDA publication. And boy, have they proliferated. In fact, you’ll hardly ever see them by themselves. They prefer the company of others, brazenly having orgies on your plants. I first experienced them in Maine, when skunks dug up chunks of my lawn looking for their larvae to snack on. Once the larvae reach maturity, they fly out of their holes and start to chow down. Though they’re quoted as eating a large variety of fruit trees andvegetable plants, they’ve only appeared on two of my crops yearly without fail: basil and bean plants. Haven’t bothered to figure out why, I just want them out of my yard. In Maine, I put a decidedly non-organic grub treatment on the lawn to get rid of the larvae for the first couple of years we were in the house and before I started gardening in earnest. That seemed to reduce the adult population in subsequent years with no lawn treatment. However, I still had beetles showing up on my plants – those were picked and executed on the spot. Again, there are milky spore and other organic treatments out there which I have yet to try. 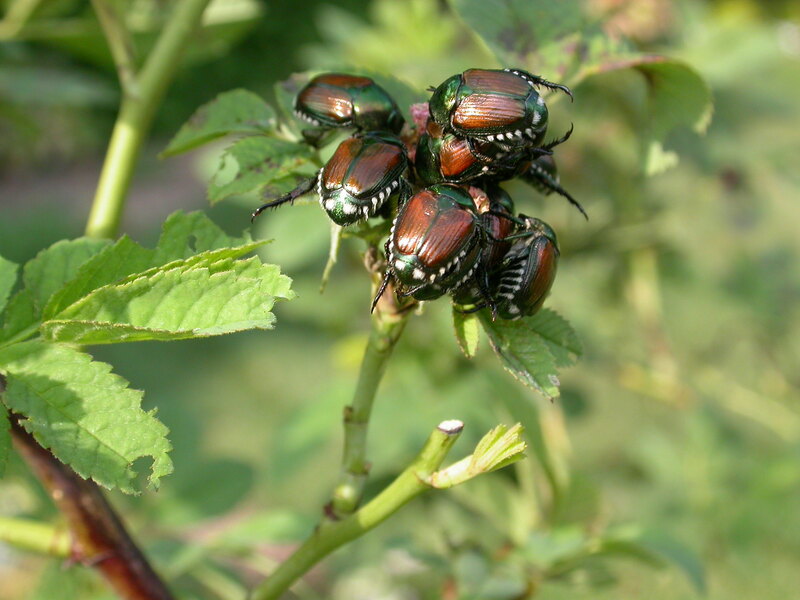 The aforementioned USDA report has good information should one decide to follow an integrated pest management plan to, er, manage these guys. The photo below is taken from the University of Wisconsin. I’ve never managed to photograph them myself, I was always too enraged at the sight of them that they were squashed into oblivion before I thought of taking their picture. The Cabbageworm. I mentioned these in a post last year when they attacked my broccoli and kale. While I saw similar bite marks on both plants this year, I never caught them in the act. My remedy, as with the other pests has been limited to diligent searching and destroying. Gardener’s Supply has a list of items you can try if this is a real problem for you. With all these pests, you’ll notice I didn’t say “get rid of” when mentioning remedies. One can only reduce the population in one’s area and must accept a certain amount of veg loss each year. This was a real hard truth for me to comprehend. Clearly, most commercial farmers refuse to accept losses and cover their crops with pesticides. Right now, I just can’t bring myself to do that, organic or otherwise. My livelihood certainly doesn’t depend on it. So once I decided to accept some loss, I started planting a little extra at the beginning of the season to compensate. Now I just have to get past the occasional grossness of nature.